The Canadian Association of Snowboard Instructors (C.A.S.I.) was formed in 1994 and incorporated in 1995. It is the professional snowboard teaching and coaching body in Canada with its Head Office located in Cambridge, Ontario. The aim of C.A.S.I. is to train and certify snowboard instructors and coaches and to ensure that a national standard of safe and efficient snowboard instruction is maintained to serve the Canadian snowboarding public and the ski/snowboarding industry. In Canada C.A.S.I. offers four levels of instructor certification. 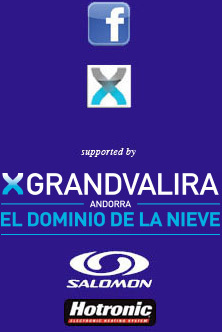 This season in Andorra we have scheduled 2 levels. Helmets are mandatory on all courses and programs. This course focuses on teaching intermediate and advanced riding skills. Level 2 is a 4 day course introducing the skill concept and progression for intermediate level snowboarding. * Ability to ride on advanced terrain and carve controlled turns on intermediate terrain. To experiment, exchange and learn about technical and instructive strategies in order to teach intermediate to advanced riders. To improve one's individual riding skills at an intermediate to advanced level. Identification of the Skills Concept in riding. Teaching tactics for Intermediate to Advanced Snowboarding. Groups will work on analysis, improvement and how to adapt exercises and tools to improve or explore skill development at the intermediate to advanced levels of riding. Groups will work on teaching tactics and skills that have been presented. Lectures will take place before and after on-snow sessions. Video will be done on a regular basis when available. A schedule of the video sessions will be communicated to the candidates. Course candidates will be assessed and updated daily on their performance and progress. Results will be given to each candidate at the end of the course. skills: advanced riding skills (stance & balance, pivoting, steering, edging, pressure control and timing and coordination will be adjusted according to speed and difficulty of terrain). Pass – meets standard or above standard. Fail – below standard. In a situation where the candidate fails both the riding and teaching, he/she will have to take the full course over again. In a fail situation for either riding or teaching, the course candidate will have until the end of the following season to take a retest for the portion failed. If it is riding, the candidate will attend Day 1, and if it is teaching, it will be Day 4. Candidates will be trained and evaluated during those days only. If the candidate does not take a re-test within the time limit stated above, then they will have to take the full course over again; but will only be required to retest the portion(s) missed.